Until we went to Malawi, being a medical student had involved lectures and a short introduction into hospital life. Malawi brought us many firsts. There, we got our first true taste of what it is to be a doctor. It was there that we first saw the birth of a baby. It was there we had our first real experience of the death of a patient. It was the first time we’d been asked questions not to test our knowledge, but because someone wanted our opinion. It was the first time we got a taste of what is it to be responsible for a patient. We spent the first four weeks of the summer of 2010 in the Holy Family Hospital in Phalombe, southern Malawi. “Holy” is tucked into the foothills of Mount Mulanje on the Mozambique border and is one hour away from the nearest main road. It is the only hospital in the region, serving an official population of about 350,000, not counting the many patients travelling from neighbouring Mozambique. It was first established in the 1970s by Dutch nuns and is now Malawian-run by the local diocese. It is a private hospital and few locals can afford to pay their healthcare costs. However, as most patients are referred to the hospital by the local medical centre, the government covers the costs. It has one qualified doctor. The rest of the care is delivered by clinical officers, as is the norm in most of Malawi. Clinical officers have the same responsibilities as non-consultant hospital doctors (NCHDs) in Ireland. However, clinical officers spend just three years training before being qualified to work in all fields of medicine, including the performance of most surgical procedures in the hospital. Once a month, a gynaecologist from a large hospital in the nearest city comes to host a clinic. Our day began at the very civilised hour of nine with the morning handover, a meeting attended by all medical and nursing staff. It was the time to discuss any patients who were critically ill or who had passed away during the night. We would then divide up onto the four wards - male general, female general, paediatrics and maternity. We did rounds with the clinical officers and helped carry out any procedures that were necessary, such as lumbar punctures and chest drains. Lunch in the hospital was a leisurely affair, lasting about three hours! Our afternoons were mainly spent in clinic or in minor theatre. There were many HIV clinics, at which the patients’ CD4 counts were monitored and treatment was adjusted accordingly. Malawi has quite a good HIV treatment programme, with maintenance treatment being provided free of charge by the government. In minor theatre we debrided, sutured and dressed wounds, and set broken bones. We were informed that the plaster of paris requirement increases exponentially in October as all the children start climbing trees in mango season! HIV is endemic in Sub-Saharan Africa and affected at least half of the in-patient population. Meningitis, TB, pneumonia and falciparum malaria were among the most common adult presentations to the hospital. The paediatric ward was filled with children with problems ranging from serious burns (most cooking is done on open fires) to snake bites, fractures, respiratory distress and malnutrition. We worked in the hospital during a measles epidemic, emphatically illustrating how important vaccination is. In sharp contrast with Irish hospital wards, elderly patients were few and far between. Many of the sickest patients were close in age to us. The hospital’s investigation facilities stretched to gram stains, full blood counts, malaria blood films and an x-ray machine. The neonatal resuscitation equipment was simply a single lightbulb to warm the sickest and smallest premature babies, despite the fact that the hospital was the referral centre for complicated deliveries presenting to the primary care clinics. We had expected to be confronted with a lack of resources but the biggest differences, and some of the most challenging, were the cultural ones. In Malawian hospitals, their own family cares for patients’ non-medical needs. They are fed, washed and dressed by the family members who fill the open-air court- yards cooking on open fires and sleeping outside in order to care for their loved ones. The Malawian people are very relaxed, illustrated best by the fact that there is no Chichewa (the language of Malawi) word for emergency - the concept does not exist. If a patient deteriorates while everyone is on lunch break, it was next to impossible to get someone to help. Urgency is simply not a feature of life, and death was readily accepted as an everyday part of life. The influence of the sangoma (traditional witch-doctor) was everywhere, most patients would present to the hospital only after exhausting their options with him. As a result people presented in the advanced stages of their illness with clinical signs that you might read about in books, but hope never to see. Malawi is proudly known as the warm heart of Africa, and the warm heart of Malawi is the people. Being the only “azungus” (white people) for miles, we generated a lot of attention everywhere we went. Children came charging through the fields to wave or walk with us. People were eager to welcome us to Malawi, and delighted in bombarding us with questions about the previously unheard of Ireland. There was never any other agenda than curiosity and the desire to make us feel welcome. We met Gemma Brugha, an Irish ex-nurse who worked in Holy in the seventies and eighties, teaching in the nursing school on the grounds of the hospital. Twelve years ago she stopped teaching and set up the Likhulesi Project, a fantastic grassroots initiative based in the neighbouring village which provided practical support to AIDS patients living in the community. Volunteers visit the patients - their neighbours - a few times a week to help with everyday tasks that they are unable to manage like fetching water from the well or chopping firewood. The project also supplied the patients with a sleeping mat (the houses all have mud floors and walls), a bar of soap and paracetamol if it was available. The project supports AIDS orphans to stay in school and assists families who take in these orphans with a little extra grain. The project also aims to raise awareness about HIV – ensuring to educate the children as early as possible about HIV prevention by performing plays and songs around the theme through their drama group. It was sad to leave Holy, after spending a fantastic four weeks there. 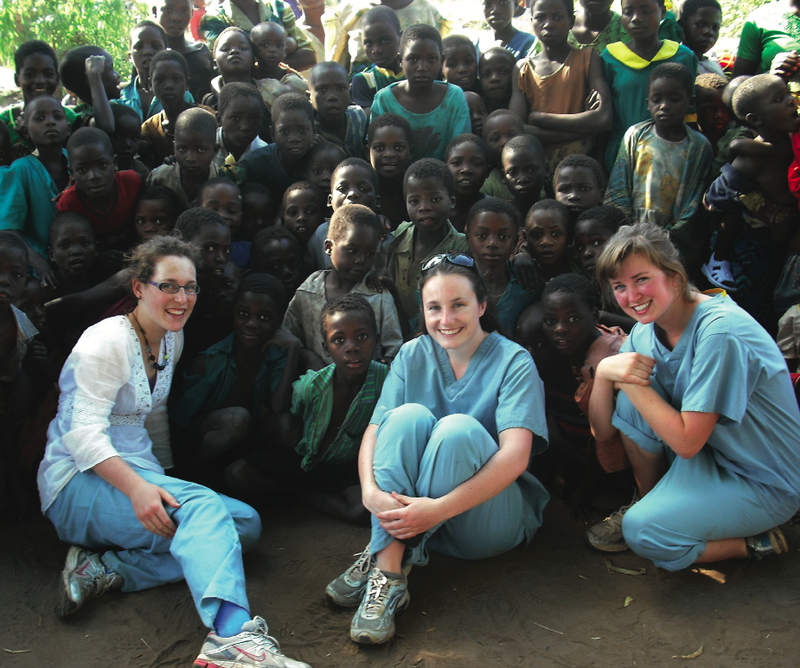 We would always enthusiastically recommend anyone to visit Malawi as a medical student. Clinically, our skills improved. After being confronted with countless cases of pneumonia, auscultation couldn’t but come on in leaps and bounds! And more importantly, we were lucky enough to experience a completely different way of life as we lived in the warm community that was Holy village.